Fresh sage has high antioxidant abilities, and you don’t want to miss out. Because it can help protect your body’s cells from damage caused by free radicals, which most often results in cell death, impaired immunity, and chronic disease (Link here to consider: Helping Your Immune System Function Smarter). Medical studies using sage extract with Alzheimer suffers, showed an improvement in cognition as well as less agitation compared to the placebo group. Other studies have reported that sage can improve memory in young, healthy adults also. Another medical study using forty volunteers who had diabetes and high cholesterol. The patients were given sage leaf extract for 3 months, and at the finish of the study, the participants had lower fasting glucose, HbA1c, total cholesterol, triglyceride and LDL (bad cholesterol), and the HDL (good cholesterol) had risen. Sage, as well as many other herbs, has anti-inflammatory, anti-fungal and antimicrobial effects. 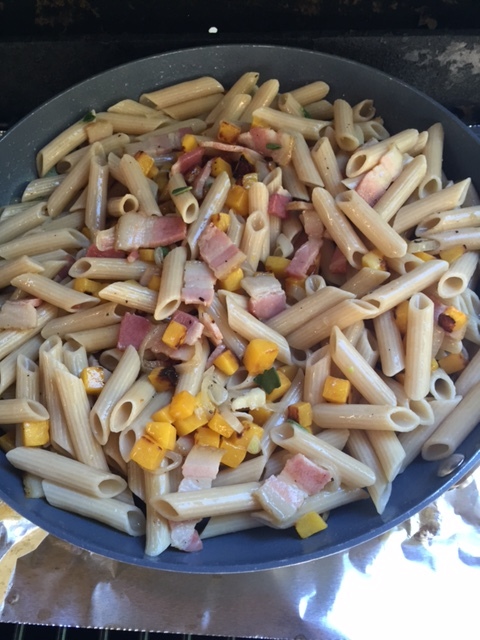 Those are just some of the great reasons to enjoy making: Gluten Free Rigate with Roasted Butternut Squash and Smoked Bacon, which involves fresh sage. 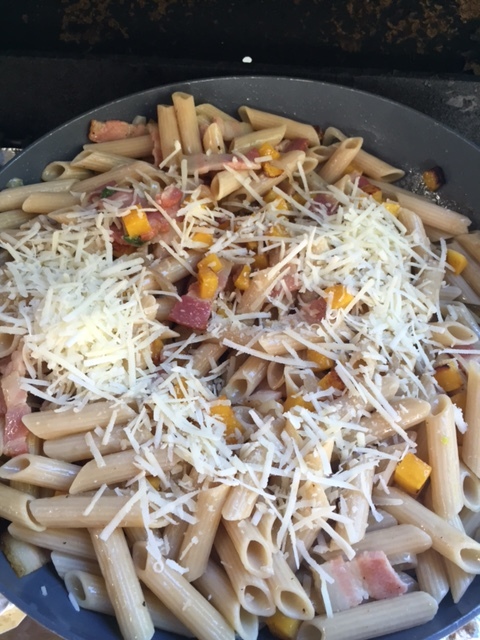 This meal cooks in about 30 to 40 minutes. 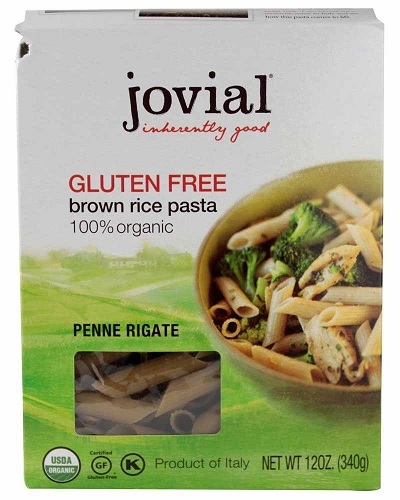 In a pot of boiling water, cook the gluten free pasta according to package instructions. Drain the pasta and rinse, reserving 1 cup of the pasta water. Most Jovial pasta instructions do not say to rinse, but we do, so the pasta will not stick, while it sits waiting to be used. 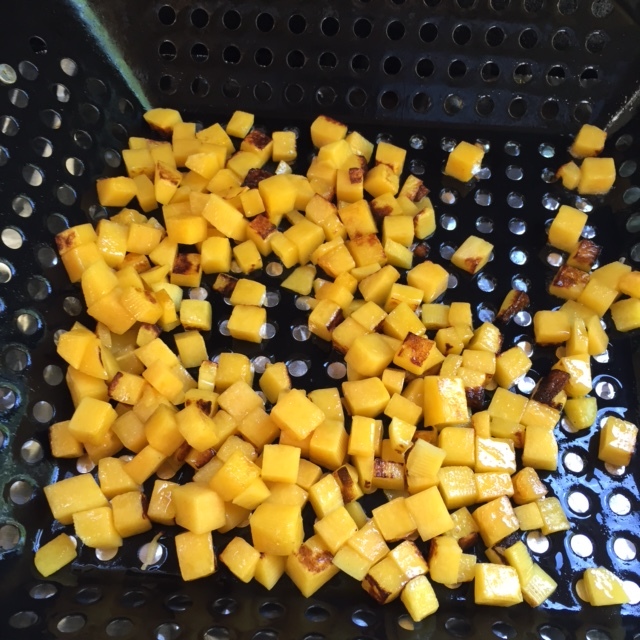 Now you can roast the butternut squash coated with olive oil in a preheated 425 degree oven (that’s great for colder weather) or you can do what we did and roast the diced squash coated with olive oil (1 tablespoon) on a hot BBQ grill using a BBQ basket. Just add the squash to the basket and close the lid for about 15 minutes or until the squash is browned and tender (but not to soft or mushy). 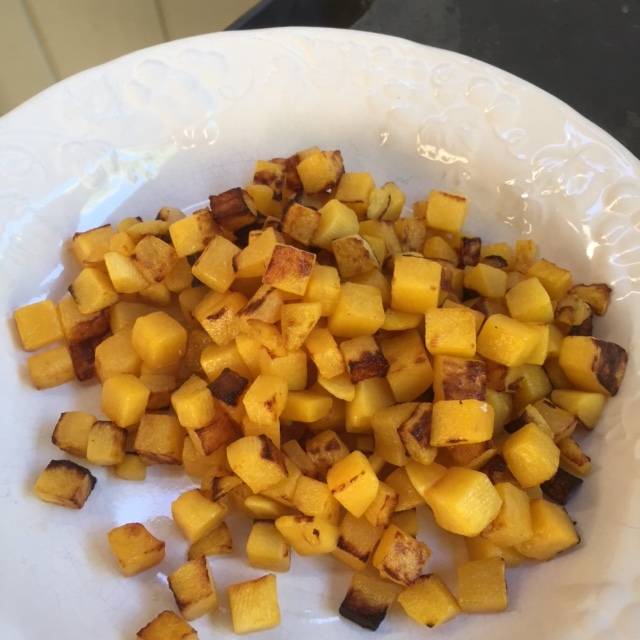 When butternut squash is brown and tender, remove and set aside. 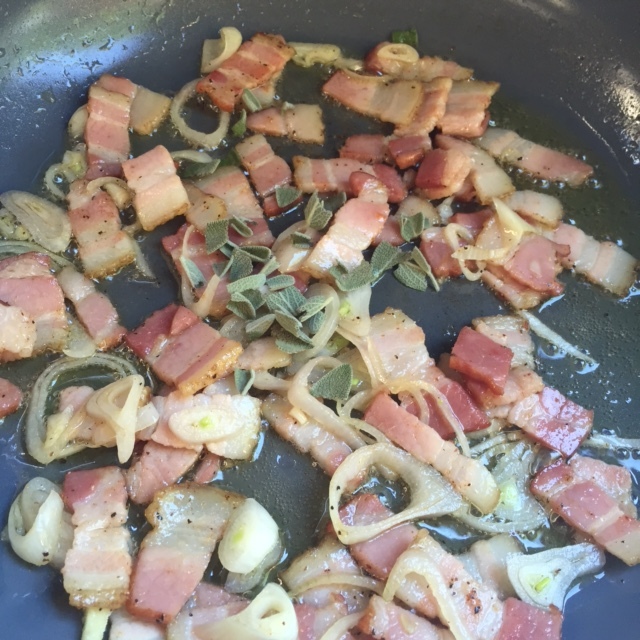 Heat on the grill remaining 3 tablespoons of olive oil in a large ceramic coated skillet (or skillet of your choice), and add the smoked bacon and cook until lightly browned, about 5 minutes. Next add the shallots, crushed red pepper and a generous pinch of black pepper and mix in. Next add the sage, mix in and cook until the shallots are soft, about 4 minutes. Next add the squash, rigate, and the reserved cooking water and cook over heat, tossing gently, until the sauce is thickened, about 2 to 3 minutes. Next add and mix in the 1/2 cup of Pecorino cheese. 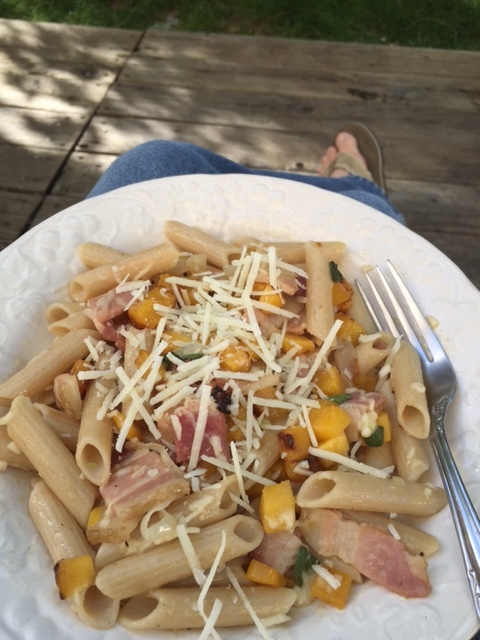 Plate and serve, passing extra Pecorino cheese at the dinner table, or enjoy out on your back patio during a warm summer evening. 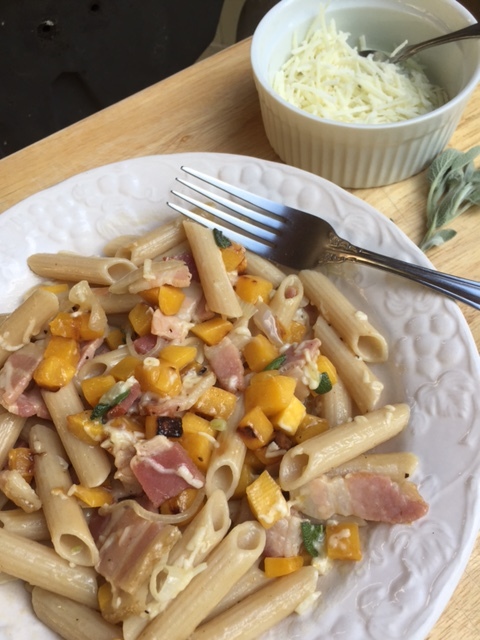 This entry was posted in Gluten Free, Main Dish, Meals in 30 Minutes or Less, Pasta and tagged Alzheimer, Apple Wood Smoked Bacon, BBQ, Butternut squash, ceramic coated pan, cholesterol, cognition, diabetes, free radicals, fresh herbs, fresh sage, fresh sage health benefits, gluten free pasta, gluten free penne rigate, Immune system, Olive oil, Pecorino cheese, pecornio cheese, roasted butternut squash. Bookmark the permalink. Thanks Luis. I am glad that your friend can benefit from the recipe considering their health condition.